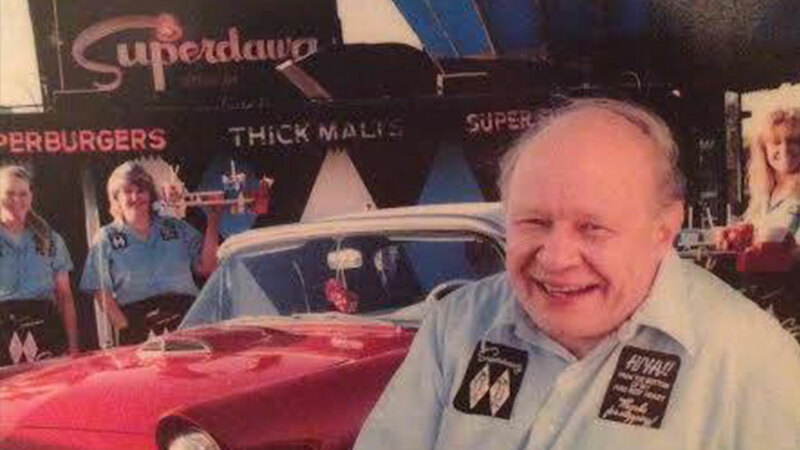 GLENVIEW, Ill. (WLS) -- Maurie Berman, founder of Chicago's Northwest Side hot dog institution Superdawg, died early Sunday in hospice care in Glenview, according to his family. He was 89. One of the first drive-in fast food joints of its time, Maurie and his wife Flaurie have been immortalized in cartoon hot dog-form atop Superdawg at 6363 N. Milwaukee for 67 years, a beacon of joy for encased meats enthusiasts for generations. Maurie Berman returned from World War II-where he fought in the Battle of the Bulge-and studied at Northwestern University with Flaurie, his Von Steuben High School sweetheart, said his son Scott Berman, who manages the day-to-day operations of the Norwood Park restaurant. The two were married in 1947. He was training to be an accountant and his wife a Chicago Public Schools teacher, but seeing other GIs returning from the war and starting small hot dog stands with walking carts, Maurie got the idea for a restaurant where people could be served without leaving their cars, his son said. Superdawg opened on May 8, 1948, with the couple originally looking to pay tuition costs in the summer, but soon it became a full-time operation, according to his family. As their family grew, so did their number of employees. "We learned our ABCs in the restaurant," said Maurie's daughter Lisa Drucker, who also helps manage Superdawg. "All of our family grew up together learning the business. It was a really special culture we created. We all know our way around the grill." Superdawg pre-dates fast-food giants McDonald's and Burger King, and Maurie Berman turned down offers to join such corporations to focus on his own restaurant, his family said. "He wanted to create an experience unique and enjoyable for everyone who walked in the door, and he knew that you lose that personal experience when you start getting bigger and bigger. He had the pride and tenacity to stay true to what it was," Scott Berman said. Maurie kept showing up for work every day and chatting up customers until the last few months when heart ailments began hindering him, his family said. "He was a brilliant man with a simple approach, and he was completely devoted to his family and his customers," Scott Berman said. The Berman family now is entering its third generation of Superdawg workers, after Maurie Berman's great-granddaughter Talia chipped in at the restaurant last weekend, his family said. He also is survived by his wife, Flaurie; children Lisa, Myles and Scott; and grandchildren Alyssa, Laura, Steffie, Max and Ross. Funeral arrangements hadn't been made Sunday afternoon, but both Superdawg locations will be closed Tuesday in Maurie's memory. Copyright 2015 Sun-Times Media, LLC. All rights reserved.